When I was in school, I had a debilitating fear of tests. Even though I'd studied and knew the material, the stress would cause me to freeze up. It sent me straight into fight-or-flight mode. I viewed the test as a threat and couldn't remember the answers. Sometimes, if I had time to go over the questions a second time, I would be more relaxed and more answers would surface. Despite this, my grades were decent. But I know they could have been better without the paralyzing fear and stress. This is one of the things stress does when we feel threatened. Our bodies were developed to deal with physical dangers by having extra energy to fight a danger or flee from it. But in our modern society, having a tense relationship with the boss, a deadline for a project or taking a dreaded test can trigger the exact same response. The mind doesn't distinguish between a physical danger and a mental threat. But stress does have a good side. When stress is controlled, then it helps us to learn and grow. To build a muscle, we stress it by lifting weights or going a bit beyond what's comfortable. When we feel excited, creative, stimulated or challenged, we're triggering the same pathways as when we have excessive stress, just not to the same degree. The downside of stress is that it can also make us feel anxious, tense, hypervigilant, drained, depressed and hopeless. We feel like we have no control. There will always be some stress we can't control. The best we can do is minimize its effects on us. For instance, when we have too many things to do, a toxic boss, or a loved one who is ill, we need to take steps to take care of ourselves. But there's research that shows that if you don't believe that stress is harming you, it doesn't. Your belief and perception that stress is a challenge reduces the dangers of the same amount of stress that harms other people. I once had a friend who refused to use the word "stress." He didn't like the connotation, so he used the word "pressure" instead. Research is showing he had it right. In an eight year study, researchers found that people under high levels of stress had a 43% increased risk of dying. That's not unexpected. 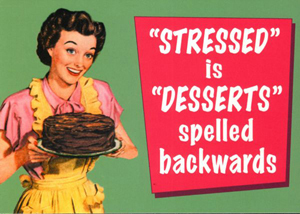 We all know the dangers of stress and how it can affect our health. Those who had a negative view of stress were most likely to die. But the study also found that those under high stress, who didn't believe that stress harmed them, and instead perceived it to be a benefit, were less likely to die. They also had the least negative effects from stress, almost equivalent to people who reported low stress. Their bodies secreted a hormone that counteracted the cortisol that stress creates. Those who worried about stress and believed it was harming them suffered more consequences. Their belief became a self-fulfilling prophecy for them. In the same way, those who perceived the stress as energy, preparing them for a challenge or excitement minimized the unhealthy effects. Changing your mind about stress changes your body's response to it. Belief is powerful. Not everything you believe is factual or real. But you make it so by your attitude towards stress. Henry Ford said, "Whether you believe you can, or you believe you can't—you're right." So how can you shift your attitude and make stress work for you? Reframe your perception of it. For instance, when I got into college, I decided to change my attitude towards tests from one of fear to thinking of them as a challenge. It allowed me to more easily retrieve the answers from my memory and my grades reflected my improved mindset. When you reframe your attitude towards stress, you shift your relationship with it. No longer are you helpless in the face of stress. You're taking control, which is one of the ways you reduce stress. To downgrade your emotional charge around the idea of stress, use the word "pressure," like my friend did. Or use some other word to describe it, such as "hassle." Words matter. When you use a different word, it immediately changes the way you feel about the subject. And the way you feel affects your body, your thoughts, and your responses to the situation. Like my shift in perception about tests, look at the situation or condition as exciting or a challenge. Instead of resisting the stress, which increases its power, change your attitude so it becomes natural and something that you can handle. By viewing it more positively, it also allows you to think more clearly about what you want to do. Your beliefs can put you in control of how stress affects you. When you change your beliefs, you you change your life conditions. Once again, the idea that Norman Vincent Peale stated, "Change your thoughts and you change your world," is confirmed.